Despite its title, this is a peaceful card. It echoes the fate of the Norse god, Odin, who hung upside down from the World Tree, after which he was guided to the prophetic meanings in the runes. His waiting brought him a great reward. The card is numbered XII which reduces to the number III, the number of The Empress, the tarot mother. While the Empress is physically creative, The Hanged Man is inwardly creative, incubating a great realisation. You may need to wait around - for a decision, a work offer, or another sign of commitment. However, while you’re in limbo, you can use this time well: to gain a new perspective on a situation. You may also consider making a sacrifice if this feels like the best way forward. 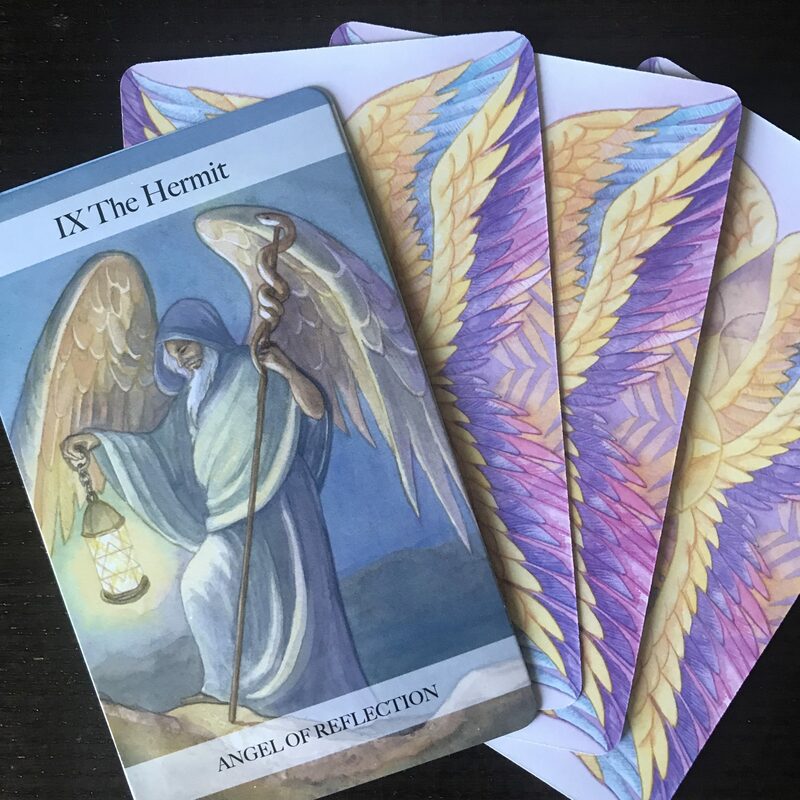 The card also has the meaning of spiritual reflection; you may need to be patient to get the answers you seek from your guides and angels. Power Message Try to see your situation from another angle. The Angel of Transformation cuts the ties and invites us to contemplate change. The ties that bind us to other people and possessions offer security, but can also restrict us. If we cannot let go of what is no longer right for us, the Universe intervenes and makes a choice we often cannot make for ourselves. Numbered XIII, a traditionally ‘unlucky’ number, in numerology thirteen reduces to four, the number of stability and the aftermath of Death’s transition. The Death card brings a gift of transition into a new phase. It does not mean physical death; the card reveals the death, or ending, of old ways. You may say goodbye to a relationship, home, or work situation, and often, this may not be your choice. As you feel the loss, though, part of you will know that this change is necessary; to flourish, you need to be elsewhere. As Death clears out the old in readiness for the new, an additional meaning is decluttering your home and cleansing your space. Power Message Allow nature to take its course. Accept loss rather than fight it – there are positive new opportunities coming your way.